Continuing with our theme(s) from last week, I want to keep this super short and sweet during this extra busy time, and give you all the tools you need to support yourself during the holidays!! 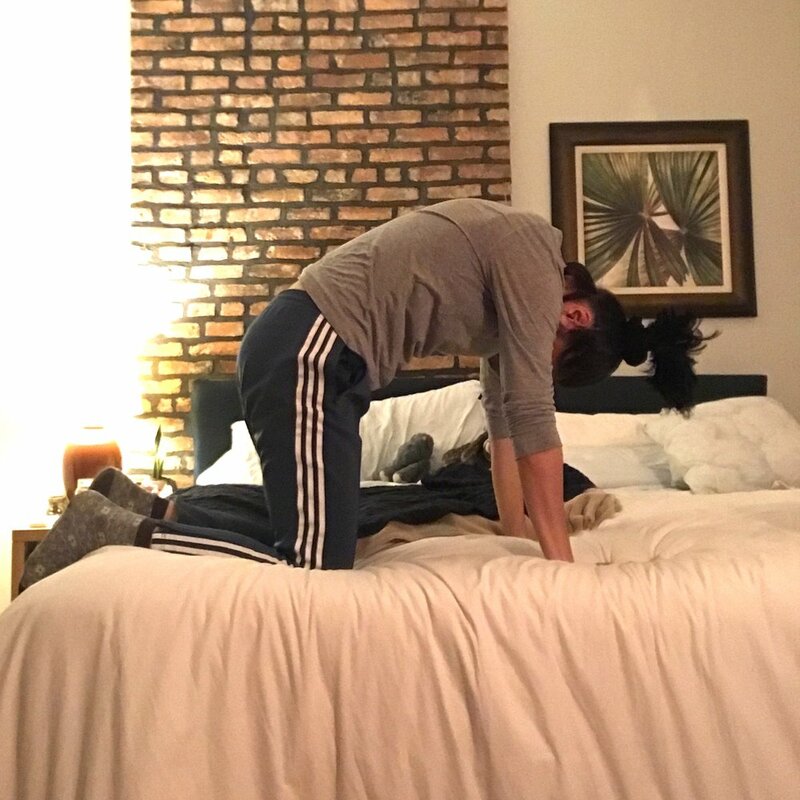 I did these moves myself because I ate a few too many nachos last night and came home with a bellyache :( I knew I needed to give my organs a good massage, which - surprise - yoga does just that! Twists are especially good for digestion, but don't forget you can also actually lay there and massage your belly; whether it's hurting or not, self-massage is a great practice that will help with digestion and those all-around self-love vibes. 1. Start on hands & knees, moving into cat/cow: Exhale to round your spine and pull your belly up and in (shown here). Inhale to drop your belly down and lift your tailbone and chest (not shown). Move through 3-6 cycles, slowly. 2. Keep your right hand grounded as you inhale and reach the left arm up to the ceiling for a twist. Exhale to slide that arm under your right armpit (see next photo). 3. Thread the left arm under the right side of your body, palm facing up. Let your left ear come down and your right arm extend out in front of you. Hold for at least 5 slow breaths (or up to 5 minutes). Repeat (including that initial twist) on other side. 4. Bring your big toes to touch and spread your knees wide. Let your hips rest toward your heels and extend your arms out in front of you for child’s pose. Hold for at least 5 slow breaths (or up to 5 minutes). 5. Come to a seat and step your right foot outside your left knee. Lift up really tall in the spine, and turn to the right, wrapping your left arm around your right knee. Hold for 5-10 slow breaths. Repeat on the other side. 6. Stack one knee on top of the other and lean forwards for my personal fave: cowface pose. Hold for at least 5 slow breaths (or up to 5 minutes). Repeat on the other side. Note: this is an intense hip stretch. You can sit up on a pillow, slide the knees further apart, or take the same shape on your back for a gentler stretch. Just be mindful of your knees and keep the feet flexed if you feel any sensitivity. 7. Lie on your back and stick your legs up in the air - even better, rest your feet against the wall and just relax into this gentle inversion. I tend to enjoy draping my arms overhead for an added chest opening. Hold for at least 5 slow breaths (or up to 5 minutes). Note: This one’s really good for sleep & anxiety because it calms the whole central nervous system; also feels great if you’ve been on your feet all day. 8. After hanging with feet up for a while, flex your feet (pressing your heels upward) and gently grab onto your legs. Keeping your tailbone down, draw your legs towards your chest for one final stretch. Hold for 5-10 slow breaths. Finally, climb under the covers and go to sleep! Starting at the toes and working your way up, relax each part of your body. Breathe slowly and intentionally, as if you’re breathing in and out of that body part. If a part (your jaw, for example) is hard to relax, try tensing it first and then relaxing it.